A hardiness zone is a defined geographical area in which specific categories of plant life not only tolerate, but are also capable of growing in, based on average climate conditions (primarily, minimum average temperature) for each zone. What plant hardiness zone do YOU live in? HOW TO USE THE INTERACTIVE ZONE MAP: Use your mouse (or mobile device stylus) to hover over a county name to the left of the map or hover directly above the county on the map. The county list scrolls up and down. A thumbnail view will appear. 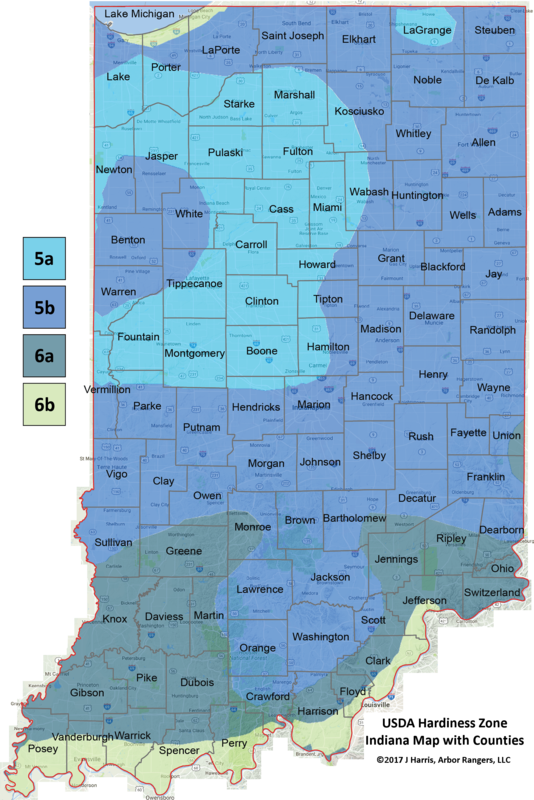 To get a closer look at the county’s plant hardiness map, click on the name from the list or click directly on the county on the map and an enlarged county map will appear to the right of (or just below) the map. To reset the map, do a “refresh” on your web browser. HINT: Viewing the map on a small screen mobile device in portrait position may not display the County name list. Try viewing this page with your device in landscape orientation to broaden your view. Hover mouse pointer over a county to see a zone map. *For the most part, hardiness zones do not follow county borders. Some counties are within more than one hardiness zone, therefore the color of the hardiness zone capturing the largest area of each county is displayed. County Map images created by Jeff Harris and copyright © 2017 Arbor Rangers, LLC. This method of categorization was first developed by the United States Department of Agriculture (USDA) and is similarly being used by other countries, such as Australia, South Africa, Ireland and throughout Europe. The USDA Plant Hardiness Zone Map is the standard by which gardeners and growers can determine which plants are most likely to thrive at a location and is based on the average annual minimum winter temperature, divided into 10-degree F zones. Therefore, a plant that is described as “hardy to zone 6b” can withstand a minimum temperature of 0°F or about −18°C). On the other hand, a more resilient plant that is “hardy to zone 5a” can tolerate a minimum temperature of -15°F (or about −26°C). Successful tree planting should first include familiarity with which plants best grow in your zone. You can almost never go wrong with planting native species, but of course you still need to consider a tree’s preferred soil type and what its mature size potential could be before purchasing one and planting it. By all means, avoid purchasing and planting INVASIVE SPECIES and be sure to check out Sandy’s list of Native Trees of Indiana. An explanation of invasive species can also be found with the tree list.